The holidays are here! I'm excited about spending time with family and friends, eating goodies that I don't need and of course, styling my hair for the holidays. I recently shared on Facebook that I received products from Pantene to create a holiday hairstyle. For the holidays, just any old style won't do. I want something elegant, but unique. Before I began my search for a hairstyle, I decided to take a gander at the products sent from Pantene. I tried and reviewed the Pantene Truly Natural line earlier this year. In addition to the Truly Natural products, there are four additional products that I can use to create my holiday hairstyle. If you know me, I'm not afraid to experiment with my look. This year alone, I both cut and colored my hair. I decided to turn to Pinterest for inspiration. 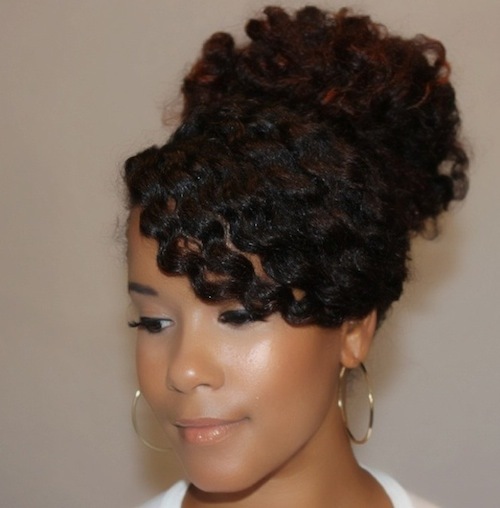 On Pinterest, I found this look by Jada Beauty. I love this look because not only is it beautiful, it would really allow me to play up my grown out bangs. Since my hair was washed less than a week ago, I plan to achieve this look on my already blown out hair. I can't wait to see how it turns out. Did I mention that one of you will win all nine of these Pantene products in the top picture? Yes, believe it! What do you think? Are you loving the look as much as I am? Love it! Might try this since my straightened hair is getting old. Love the look and thanks for the giveaway. I'd like to try the clarifying shampoo. Waiting to see your version of the style! I'd love to try the shine serum with argan oil. I absolutely love the look! And I'm most excited to try out the Defining Curl Styling Custard. Great giveaway! Going to check out your review of the Pantene Truly Natural line now. Oh - and love that hairstyle. It's simple, yet elegant. I can't wait to see what you come up with! I've heard great things abt the BB cream and custard! I would love to try that BB Cream! I love that hairstyle! Looks like a great style for a new years eve get together.I would rock this hairstyle with some chandelier earrings to set this look off! Ohh, *grabby hands* at them products. My mane needs to be tamed. Your hair is always laidt so I'm sure it's gonna come out good! I've been wanting to try out that BB cream. Heard great things about it and my hair is needing all the help it can get right about now. Such a pretty hairstyle! I cant wait to see the look you come up with. I've never tried any Pantene products, and would love to try all of them especially the defining custard! I would love to try the Keratin Repair Oil Mist! I absolutely LOVE this look and would LOVE to try. Thank you for an great giveaway. I would love to try the argan oil!!! That hair photo is gorgeous. I'd love to try the Pantene Cowash Cleansing Conditioner! The look is nice, looks easy enough to recreate. I haven't tried any of those products, interested in trying them all. This hair style is very elegant and playful... I have not yet tried Pantene's products... is on my list to try. It would be a blessing to try them via you... thank you for the opportunity.